I’ve since read quite a few books about DiMaggio and about the Yankees during the DiMaggio era. The last one I read was the critical 2001 biography by Ben Cramer. I’ve come to the conclusion that much of the aura that surrounded the Yankee Clipper was based on his amazing baseball skills and achievements. But a large part of it was also due to the fact that the New York and national sports media of his era worshiped the guy and Joe maneuvered that worship brilliantly. This level of celebrity pandering by the media has become much less possible because today’s athletes get too much exposure. For example, Yankee fans can watch their team play every single spring training, regular and postseason game on high definition, big-screen TVs. Sportswriters are no longer free to embellish something that everyone is seeing with their own eyes. The Internet and the proliferation of sports bloggers has also made hiding a star player’s off-the-field behavior nearly impossible. Just ask A-Rod. 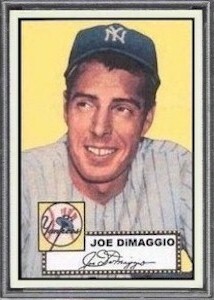 I would have loved to watch Joe DiMaggio play the game but I didn’t get the opportunity. As a die hard Yankee fan, I celebrate his accomplishments. But I believe the truth is that DiMaggio eventually got wrapped up in his own press clippings to the point that he actually believed he was perfect and that everyone else was out to get him. It was the pressure of maintaining that image that made DiMaggio a bitter man, the superstar who would not say a single word to a young Mickey Mantle during the Mick’s rookie season, who thought Casey Stengel was trying to embarrass him into retirement, and who pretty much abandoned his only son. Why is it that people who have so much going for them have such a difficult time just being happy? DiMaggio shares his November 25th birthday with this former Yankee infielder, this Yankee outfielder and this more recent Yankee outfielder.